How great it must have been to witness the first pictures as they started to move or to see the Lumiere brothers amazing the crowds with their very first short films. After over 200 years of movie making, million-dollar-special-effects, big scale film studios and endless Hollywood dramas, we give you the chance to return back to the roots of movie making and witness the very first steps of moving Lomography. The LomoKino allows you to become a director yourself and capture Lomographic movies on 35 mm film of any kind: no sound, no special effects, no post production – just simple Lomography in motion. To become a true LomoMovie director, just simply wind the crank of the magic box to capture 144 shots on one roll of 35 mm film - which makes 36 to 48 seconds of LomoMovie. You can use any kind of 35 mm film for different effects: Slide film, colour negative, redscale or B/W. After developing the film, spool it into the specially developed LomoKinoScope and watch your Lomographs moving over and over again. What sounds very simple produces a unique piece of art which can either stay in your hands only or can be given as a special present to somebody who really deserves it. Show your sweetheart how fast your heart is really pounding or capture a flying birthday cake for your grandma who will feel catapulted back in time. A wise man once said “form follows function” – naaaah – we like to say “form follows motion” and that’s why we designed this camera to become a true gadget. Its irresistible design takes you straight back into the time when people left the audience screaming because a locomotive was speeding towards them on a movie screen and the movies were still a true business without special effects. It comes in a package either alone or with the LomoKinoScope, one film canister and a marvelous book. Its creative possibilities are so diverse that not even we can tell the limits. It’s up to you, gadget lovers, to take this baby in your hands and explore what movies used to be like the Lomographic way! Unlike the very first filmmakers we can call a powerful tool our own: the internet! 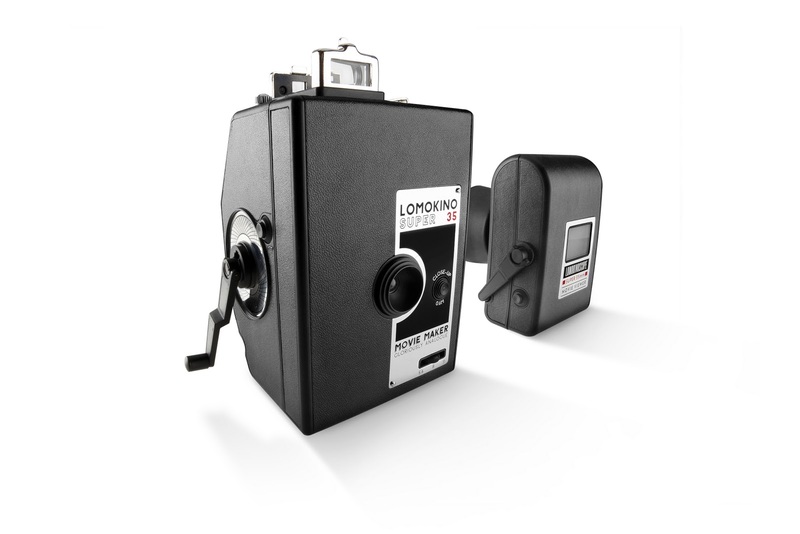 Linking the simple technology of the LomoKino with our website, enables you to upload, watch and share your own LomoMovies. To give you a taste of the special LomoKino aesthetics and the sheer endless creative possibilities, we asked filmmakers from around the globe to create their own LomoMovies. Visit our website to get some inspiration and start shooting your first LomoMovie! The Lomographic Society International is a globally active organization dedicated to experimental and creative snapshot photography. Boasting over a half-million members across the world, the concept of Lomography encompasses an interactive, vivid, blurred and crazy way of life. Through our constantly expanding selection of innovative cameras & photographic accessories, we promote analog photography as a creative approach to communicate, absorb, and capture the world. Through the efforts and skill of our Lomographic Society members, we seek to document the incredible planet around us in a never-ending stream of snapshots – literally a global “Lomographic” portrait as seen through the eyes of countless individuals and cultures.